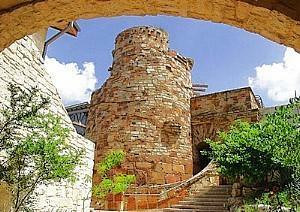 The Lady Bird Wildflower Center is a lovely swath of nature in the midst of the growing Austin suburbs. Proving it is never too late to follow a dream, on her 70th birthday, December 22 1982, lady Bird Johnson and her friend, the actress Helen Hayes, started the center to protect and preserve North America's native plants and diverse natural landscapes. Lady Bird is quoted as once saying "ugliness is so grim, a little beauty can help create harmony". The Lady Bird Wildflower Center is a 42-acre Hill Country gem that overflows with a brilliant variety of native plants and flowers and has become one of Austin's most visited spots. Here visitors will see and learn about our own state flower, the Bluebonnet, as well as the glorious Indian Paintbrush and more than 500 other species of native plants. In the heart of Austin is the Trail at Lady Bird Lake, a lush, urban path that meanders along the water's edge and passes by skyscrapers, neighborhoods, ball fields and cultural attractions. No other Austin City Park, with the exception of nearby Zilker Park, so captures the Austin spirit. With more than 1.5 million visits a year, the 10-mile hike-and-bike trail is Austin's most recognized and popular recreational area. From dawn to beyond dusk, the Hike and Bike Trail is filled with joggers, walkers, bicyclists and nature lovers. Spring is an especially beautiful time for a stroll along Lady Bird Lake (formerly Town lake) as flowering cherry trees, some of them gifts from Japan, bloom alongside native redbud trees. In quieter moments, wildlife, particularly turtles, ducks and swans can be seen swimming and feeding along the banks. Only non-motorized craft are allowed on this stretch of the lake, such as canoes, kayaks and paddle boats, which can be rented in nearby Zilker Park. Revered as an icon, the "soul of Austin", the constant 68-degree spring fed Barton Springs has been an enjoyable gathering place for anyone with a swimsuit in Austin since it became a city park in 1917. The Spanish, impressed and inspired by the natural springs, set up temporary missions here in the 1730s. The Barton Springs Swimming Park became a city park in 1917 and dams were added in 1929 and 1932 creating the swimming area. Barton Springs is a constant 68 degrees year around. The park includes an expansive grassy lawn rimmed with trees that surround the spring fed natural pool. Ziker Park is a 351-acre urban park located downtown that encompasses the Zilker Botanical Gardens, Zilker Nature Preserve and the above mentioned Barton Springs Pool. The park is loaded with sports fields, picnic tables, children's playgrounds, a frisbee disc golf course, rugby and soccer fields, and a working miniature railroad for the kids and parents to take a ride on. The train is a must ride for the children. The park hosts many of the city's music, arts and cultural events, including the Austin City Limits music festival and the Zilker Park Kite Festival. At Christmas, Ziker Park hosts a 155' tall Christmas Tree, visible from miles around. The tree is created by Christmas lights strung in a maypole fashion from the top down. Inner Space Cavern is one of the more accessible caves in the region, with a unique cable car, paved trails and a year around temperature of 72-degrees. The standard Adventure Tour lasts one hour and 15 minutes and covers three quarters of a mile; longer and more detailed tours are available. Estimated to be 100-million years old, Inner Space Cavern was discovered in 1963 by workers testing core samples for construction of the Interstate (IH-35). Now open for all to appreciate, this living cavern -meaning it continues to grow and develop- features an excellent array of formations beyond the typical stalactites and stalagmites. Multiple tours are offered, depending on how much you want to see and how long you want to stay. For a peaceful hiking trail (no bikes) this a great place to visit. You feel like you are way outside of the city. It's hard to believe that this wilderness preserve is nestled right in town. It's not grand in sights, but it is serene and a pleasurable place to enjoy a gentle hike on that of some pleasant hills occompanied by a creek and the occasional waterfall. This is not a busy trail, so if you want to be alone to enjoy a pleasurable mellow hike, this is a great place to do so. If you would like to make a short trip outside of Austin to see some of the outlying area, and to visit a park to stretch your legs and take in some beautiful scenery, the Pedernales Falls State Park would be a great place for you to visit. The Pedernales River runs through this 5,000-acre park, at one point the river gently tumbles down a series of stepped layers of limestone known as the Pedernales Falls, which is the park's main attraction. Throughout the park, there are nearly 20-miles of hiking and mountain biking trails. For birders, this park has an enclosed watching station with feeders providing lots of close-ups of the area's many birds. As a swimming hole, this is one of the area's best. 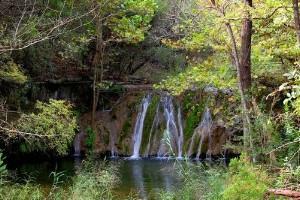 Hamilton Pool Preserve is a historic swimming hole 3/4 mile upstream from its confluence with the Pedernales River. 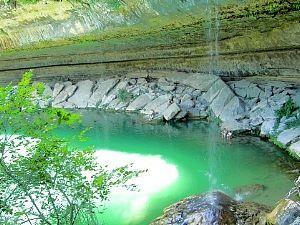 Hamiltion Creek spills out over the limestone outcroppings to create a 50 foot waterfall into the swimming hole. The Hamilton Pool is not too far away, but it is a day trip. 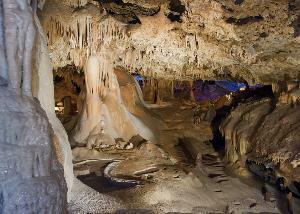 It is a fun place to picnic and take a swim in a serene grotto that's an intimate beautiful oasis. It is truly an unsuspecting beautiful place. It's a 1 mile hike to get to the pool, so it's not ideal for the small children. This place is most explored and enjoyed by teenagers and the 20s-40s adults. If you go, the weekdays are when you want to go, as there's limited parking and on the weekends the parking gets full. Also, there aren't any kind of places to eat within the preserve, so you will need to bring stuff to eat and drink.